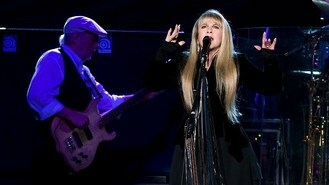 Stevie recently sang on tracks that bandmates Lindsey Buckingham, Mick Fleetwood and John McVie worked on, calling the sessions "great", although she admitted she wasn't sure where the band fit in today's music industry. "Whether or not we're gonna do any more (songs), we don't know because we're so completely bummed out with the state of the music industry and the fact that nobody even wants a full record," she said. "Everybody wants two songs, so we're going to give them two songs." The band said depending on the response to the new tracks during their 34-city North American tour next April - which Lindsey calls "the most Fleetwood Mac-y stuff ... in a long time" - more material could come next. "Maybe we'll get an EP out of it or something," Lindsey said. The group are celebrating the 35th anniversary of their best-selling Rumours album, which has sold some 20 million units in the US. Lindsey said he initially wanted to record a new album, but Stevie "wasn't too into that". But the guitarist and singer knows that new music isn't a priority for the band's fans. "It wouldn't matter if they didn't hear anything new. In a way there's a freedom to that - it becomes not what you got, but what you do with what you got. Part of the challenge of this tour is figuring out a presentation that has some twists and turns to it without having a full album," he said.